London, England – The Bahamas was successful in its re-election to the Council of The International Maritime Organization during elections at the 29th IMO Assembly held in London at the end of last month. Out of the 154 votes cast by IMO member states, The Bahamas obtained 124 votes to gain re-election to the IMO council in Category C.
Minister of Transport and Aviation Glenys Hanna Martin said that this further cements The Bahamas’ rise to the top in leadership in the maritime sector. “We are sitting on the Council of the International Maritime Organization, which is a very prestigious achievement on behalf of The Bahamas because this is the UN agency that governs maritime activities worldwide and when you know that 90 per cent of world trade is done by sea and the implications to economies and to standards and policies that this body influences and that our country, our archipelago sits on the council; in our own right we bring substantive involvement in representation to these matters,” said Hanna Martin. In the last two years on the IMO Council, The Bahamas has substantially contributed to committees and sub-committees, which handle global issues facing the maritime industry. 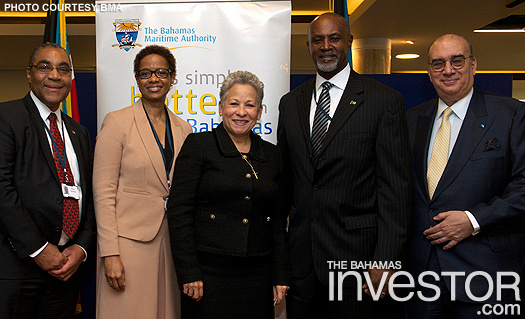 The Transport and Aviation Minister is not only pleased with the outcome of the IMO elections, but also the continuous recognition The Bahamas has been given by member states. “It is clear that there is an appreciation of our contribution by the wider body, when you look at the confidence that has been reposed on us by countries all over the world, Africa, Europe, Asia and through the region. We feel very good about it and it sets the tone for all of us to understand that as a people we are really capable of anything we put our minds to,” she said. 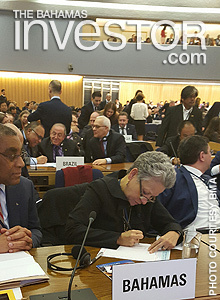 Prime Minister Perry Christie spoke at a COP21 high-level event on Small Island Developing States (SIDS) and the Climate Challenge at the Pershing Hall Hotel in Paris, 1 December, 2015. Read his statement here.